the coordinated inclination of the two lines of sight towards their common point of fixation, or the point itself. 1. The tending of two or more objects toward a common point. 2. The direction of the visual lines to a near point. 1. in evolution, the development of similar structures or organisms in unrelated taxa. 2. in embryology, the movement of cells from the periphery to the midline in gastrulation. 3. coordinated inclination of the two lines of sight towards their common point of fixation, or that point itself. negative convergence outward deviation of the visual axes. positive convergence inward deviation of the visual axes. the movement of two objects toward a common point, such as the turning of the eyes inward to see an object close to the face. convergent, adj. a form of evolution which results in unrelated organisms independently producing similarities of form, usually because they become adapted to living in similar types of environment. For example, fish and cetaceans have evolved similar streamlined body shapes and fins. 1. Movement of the eyes turning inward or towards each other (Fig. C15). 2. Characteristic of a pencil of light rays directed towards a real image point. See angle of convergence; vergence. convergence accommodation See convergence accommodation. accommodative convergence That component of convergence which occurs reflexly in response to a change in accommodation.It is easily demonstrated by having one eye fixate from a far point to a near point along its line of sight, while the other eye is occluded. The occluded eye will be seen to make a convergence movement in response to the accommodation. Alternatively, one eye fixates while the other is occluded. If a minus lens is placed in front of the fixating eye, the occluded eye will be seen to converge. Syn. accommodative vergence; associative convergence. See fusional convergence; initial convergence; proximal convergence; motor fusion. amplitude of convergence The angle through which each eye is turned from the far to the near point of convergence. Syn. amplitude of triangulation. See metre angle. correction induced convergence Convergence induced when changing from spectacles to contact lenses in near vision. Spectacles centred for distance vision induce base-in prisms in myopes and base-out prisms in hyperopes, in near vision. 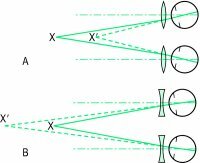 Thus, a spectacle-wearing myope converges less and a spectacle-wearing hyperope converges more than an emmetrope fixating at a given distance (Fig. C16). Optically centred contact lenses do not induce any prismatic effect and the amount of convergence remains the same for all refractive errors. Consequently, myopes require more convergence and hyperopes less convergence when they transfer from spectacles to contact lenses. However, this change in convergence is accompanied by a similar change in accommodation, so that a myope transferring to contact lenses converges and accommodates more than with spectacles and the reverse applies for a hyperope. See correction induced accommodation; induced prism. convergence excess A high esophoria at near, associated with a relatively orthophoric condition at distance. It usually gives rise to complaints of headaches and other symptoms of asthenopia accompanying prolonged close work. See accommodative excess. far point of convergence The farthest point where the lines of sight intersect when the eyes diverge to the maximum. fusional convergence That component of convergence which is induced by fusional stimuli or which is available in excess of that required to overcome the heterophoria. It is usually a positive fusional convergence, but in some cases the eyes need to diverge to obtain fusion and this is called negative fusional convergence. An example is the movement of the eyes from the passive (one eye covered, the other fixating an object) to the active (both eyes fixating foveally the same object) position. However, as disparate retinal stimuli are a more powerful component of convergence than fusion, the concept of fusional convergence is being substituted by motor fusion (or disparity vergence). See accommodative convergence; initial convergence; proximal convergence; relative convergence; motor chiastopic fusion fusion; orthopic fusion; vergence facility. fusional reserve convergence See relative convergence. initial convergence Movement of the eyes from the physiological position of rest to the position of single binocular fixation of a distant object in the median plane and on the same level as the eyes. Initial convergence is triggered by the fixation reflex. See accommodative convergence; fusional convergence; physiological position of rest. instrument convergence See proximal convergence. convergence insufficiency An inability to converge, or to maintain convergence, usually associated with a high exophoria at near and a relatively orthophoric condition at distance. It results in complaints of fatigue or even diplopia due to the inability to maintain (and sometimes even to obtain) adequate convergence for prolonged close work. Treatment includes orthoptic exercises (e.g. the pencil-to-nose exercise or pencil push-up in which the tip of a pencil is moved slowly towards the eyes while it is maintained singly for as long as possible and this procedure is repeated until the pencil can be brought within 10 cm before doubling occurs), or a reading addition sometimes with BI prisms. See accommodative insufficiency. near point of convergence (NPC) The nearest point where the lines of sight intersect when the eyes converge to the maximum. This point is normally about 8-10 cm from the spectacle plane. If further away, the patient may have convergence insufficiency. proximal convergence That component of convergence initiated by the awareness of a near object. For example, when looking into an instrument the image may be at optical infinity yet proximal convergence may be initiated. Syn. instrument convergence; psychic convergence; proximal vergence. See proximal accommodative. psychic convergence See proximal convergence. relative convergence That amount of convergence which can be exerted while the accommodation remains unchanged. Clinically, it is measured by using prisms base-out (positive relative convergence or positive fusional convergence) (Fig. C17) and/or base-in (negative relative convergence or negative fusional convergence) to the limits of blur but single binocular vision. Beyond that limit accommodation changes. If the power of the base-out prism is increased the image, though blurred, will still appear single until the limit of fusional convergence is reached and the image appears double (break point). The prism before the eyes now represents the positive fusional reserve convergence (positive fusional reserve). Similarly, increasing the base-in prism, one reaches the break point, which represents the negative fusional reserve convergence (negative fusional reserve). Syn. relative vergence. See Percival criterion; Sheard criterion; binocular vision single zone of clear. tonic convergence See tonic vergence. total convergence See angle of convergence. voluntary convergence Ability to converge the eyes without the aid of a fixation stimulus. Few people possess this ability but it can be trained in most people. The tending of two or more objects toward a common point. 1. a moving together, or inclination toward a common point; the coordinated movement of the two eyes toward fixation of the same near point. 2. the point of meeting of convergent lines.